Microsoft Support for CISPA in Question? Unlike its predecessors SOPA and PIPA, the Cyber Intelligence Sharing and Protection Act (CISPA) has enjoyed overwhelming support from the tech industry. Or at least that’s been the case until now. On Monday morning, headlines exploded with reports that Microsoft was softening its stance on the controversial cybersecurity bill. This was particularly big news considering Microsoft’s outspoken support of the bill. In fact, CISPA’s author, Rep. Mike Rogers, was sure to place the company’s letter of support on his official website. What makes the reported shift of even greater significance is the fact that the statement was made after the bill was amended numerous times prior to its rather suprising passage last Thursday night. Somewhat ironically, the amendments—many of which were made after the White House issued a veto threat—were purported to address the concerns outlined in Microsoft’s weekend statement. This isn’t at all dissimilar from the words used by Obama administration officials, warning that a CISPA that does not maintain “Americans’ privacy, data confidentiality, and civil liberties” would be vetoed. “We supported the work done to pass cybersecurity bills last week in the House of Representatives and look forward to continuing to work with all stakeholders as the Senate takes up cybersecurity legislation,” she continued. Such a statement serves to call into question the countless reports of Micrsoft’s “wavering” support for CISPA flooding the headlines just hours beforehand. According to The Hill’s deduction, this comes not as a result of conflicting statements from Microsoft but a misunderstanding by the press of the weekend statement. In other words, Microsoft remains steadfast alongside Facebook, IBM, AT&T, and many others in its support for CISPA. 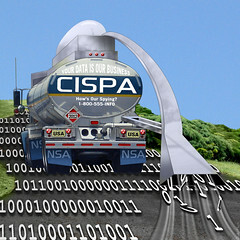 Nevertheless, privacy groups remain wary that the new measure’s language would still allow governmental and non-governmental entities to abuse the CISPA’s with impunity. However, given the much tougher path the bill must endure as it makes its way through the Senate, chances are CISPA is yet to reach its final form. For more on CISPA and its supporters . . .